Having a decent French accent is essential if you want the French to understand you! Follow my 9 steps to improve your French accent and you’ll notice progress in no time! Whether your French accent is terrible or already great, there is always room for improvement. If you want to improve your French accent, you must train with audio: written French and spoken French are like 2 different languages. But not any audio: the speed is essential, and should be adapted to your level, as should the content. Be aware of the age, the regional origin and social class belonging of the person who is speaking. All these will affect the pronunciation. If you want to learn Canadian French, then pick a speaker from Canada. I once had an Australian student of Irish origins who learned French in Senegal. Being extremely fair skinned herself, she spoke French with a strong African accent. It was quite weird, limit offensive since it looked as if she was possibly mocking an African accent. However, if you are a man, you can learn French from a woman. Unlike Japanese for example, there are no different rules of French pronunciation for man or woman. The voice may differ of course, but not the pronunciation. Songs and poetry may have chosen a different pronunciation than everyday French as to respect the rhythm or the rhyme. Not necessarily the best thing to repeat – not necessarily bad either, it depends on the song, and what your goal is. For example, Edith Piaf, Jacques Brel or Stromae have a very strong R when they sing: that’s not a common everyday French R for most French regions. Finally, make sure the recordings are made by a native French person… Unfortunately, the Internet is full of people with good intentions who don’t always realize their less than perfect contribution hurts more than it helps. I understand what I’m saying is not politically correct, but as a native French speaker myself, I cringe when I hear some of the audio featured on very popular French teaching websites. 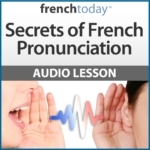 So now, let’s see the 9 steps to better your French pronunciation. To really work on pronunciation, you need to select a couple of short sentences, or cut a longer sentence into chunks you can easily repeat. Every single sound must be perfect! The shorter, the better! Once you’ve worked your way through the chunks, you can put a longer sentence or paragraph together and train on perfectly repeating it. Note that audiobooks containing questions and answers provide excellent short sentences to work specifically on pronunciation. You are not working on your French understanding. At this point, only the pronunciation matters. Whether you understand what you are saying or not is not the issue at hand. Reading the written French form with all its silent letters will only fool you into a wrong pronunciation. You need to push your French accent. Chances are this will sound ridiculous to your ear. Like you are mocking the French. That’s OK. Do exaggerate your French accent: it will sound weird to you at first, but it will sound good to everybody else. In that respect, it may be fun to watch a couple of videos of people mimicking a French accent. You can actually learn a lot from them! If you understand what you are saying, you’ll notice that some words are likely to be mashed together (like a subject pronoun and a verb). It’s normal, and it’s called a word grouping: how you group your French words. Make sure you copy the rhythm of the sentence: when the speaker speaks, when s/he pauses, when s/he breathes. Redo this exercise 3, 4…10…20 times. Until this word sequence is completely natural to you. Once you master it, revisit it a couple of days after. Repetition is the key! What are these Z, T, N sounds that are not written but start words? I bet they are liaisons. French is not written the way it is pronounced. That’s why you should ALWAYS first master the French pronunciation, then (when interested…) master the spelling. A way to check your pronunciation is to use the voice recognition software of your mobile device to dictate things in French. You can switch the language to French, and record your own text this way. However, if your pronunciation is not right, the software won’t recognize what you are saying. It can get brutal and frustrating, and keep it mind the software doesn’t always get it right… But at least, it will help you figure out if you French pronunciation is good. If you use your microphone in French, knowing how to say punctuation and other writing commands in French will be useful: here is a link. You need to repeat again a couple of times while reading the transcript to really nail down the correct French pronunciation. Some sounds are more difficult for foreigners: for example the French R.
Make sure you drill on several words with an R at the beginning, in the middle, or at the end, and different R+ vowels, but also vowels + R, Tr, Dr, Gr etc… combinations. Let’s say you have difficulty with the “u” sound. However, you’ve mastered how to say “tu”. Then, when trying to say “lugubre” in French, bring up your “tu”. It might not work each and everytime, but repetition is the key! And if it’s difficult, don’t despair. Speaking English with a decent accent is not easy for the French either! Don’t hesitate to leave a comment below and share one of your French accent tip with us!